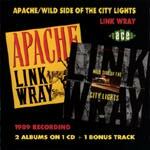 This reissue of 1989's the Wild Side of the City Lights coupled with Apache is a must have for fans of the Linkster, and for any self respecting guitar worshipper. Link Wray invented the big guitar instro, used the Bo Diddley trick of slit speaker fuzz before there were pedals, and generally created the foundation for dark rock instros, as well as set the direction for metal and other genres to come. Light weight fluff, eerie sorta accents, and pretty tones. This includes a spoken story line, so it's not really an instro, but the music bed is damn fine. Screaming tires and pick slides, vibrato, whammy, intense energy, and stark values... Link takes the hot rod instro several notches further down the alley here. Remarkable. Egads! Link's slowest meanest nastiest tone, his darkest mood, his most patient timing, and his most dangerous attack - they are all here. It's a long tortured session that leaves you drained. It's Link Wray! Nuff said!